When the 2014 Toyota 4Runner debuts next week, it will build upon a 30-year history of legendary performance any manufacturer would be proud to call its own. From its humble beginnings as a pickup with a fiberglass shell thrown over the bed, known as the Toyota Hilux Surf in 1984, the Toyota 4Runner has come a long, long way to become the subject of many beer-soaked discussions of SUV rankings. Over the course of time, Toyota has sold nearly two million units of the virtually unstoppable SUV. That’s an average of nearly 67,000 models per year. In the high, arrid, rugged and mountainous terrain of Afghanistan, they are a local favorite, along with the Toyota Land Cruiser. Incredibly, a full 75 percent of the millions sold are still on the road. We personally know a single mom who once commuted in a 4Runner up to 100 miles daily. From the northern Denver suburb of Thornton, she drove her son to school in Highlands Ranch, over 20 miles across the Metro area, and then went to work at the Denver Tech Center, another diagonal jaunt across the metropolis. At the end of the day, the reliable 4Runner made the same journey in reverse. Ms. Leyba told us she had put over 250,000 miles on the 1995 4Runner by 2007 and had never done anything other than standard maintenance. That’s the stuff from which legends are made. Chances are good she’s still driving it, though her son should be in college and may be its owner by now. That sort of performance has something to do with the underlying reasons J.D. 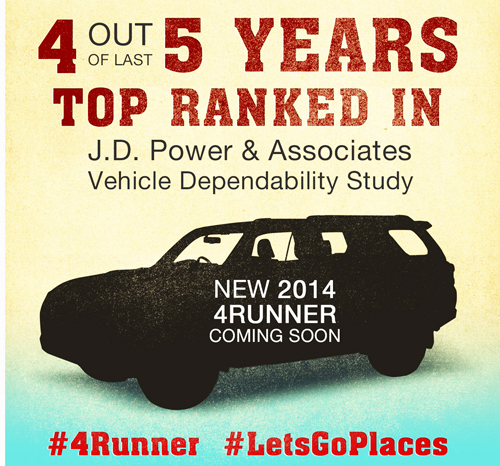 Power listed the Toyota 4Runner as Top Ranked in its annual study of automotive dependability four of the last five years. The new 2014 Toyota 4Runner will debut at the Stagecoach Country Music Festival in Indio CA, at 1:15 pm Pacific Time on April 27.